Part 1 Structure-function relationship of carbohydrate-active enzymes: Biosynthesis of polysaccharides; a-amylase. Interaction with polysaccharides substrates, proteinaceous inhibitors and regulatory protein; Why could isopullulanase, an odd pullulan-hydrolyzing enzyme, be discovered? Sequence fingerprints in the evolution of the ?-amylase family; Molecular mechanism of ?-glucosidase; Structure, function and applications of microbial a-galactosidase (lactase); Structural feature of the archeal glycogen debranching enzyme from Sulfolobus solfataricus; Molecular cloning of the amylosucrase gene from a moderate thermophilic bacterium Deinococcus geothermalis and analysis of its dual enzyme activity; Substrate specificity, kinetic mechanism and oligomeric states of cyclomaltodextrinase from alkalophillic Bacillus sp. I-5. Part 2 Functions and applications of carbohydrate-active enzymes: Enzymatic modification of starch for food industry; Glycosylation of carboxylic group: A new reaction of sucrose phosphorylases; Strategy for converting an inverting glycoside hydrolase into a glycosynthase; Characterization of novel glycosides using the glucansucrase; Microbial exo- and endo-arabinosyl hydrolases: Structure, function, and application in L-arabinose production; Enzymatic synthesis and properties of trehalose analogues as disaccharide and trisaccharide; Glycosidases and their mutants as useful tools for glycoside synthesis; Enzymes for grain processing: Review of recent development in glucose production; Characteristics of archaeal maltogenic amylases. 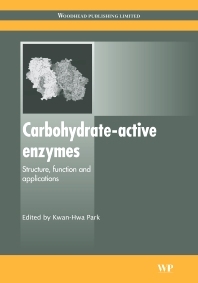 The book is based on papers presented in the 2008 Agricultural Biotechnology Symposium Carbohydrate-active enzymes: structure, function and applications held on September 26th-27th 2008 in Seoul National University, Korea. This symposium was organized by the Center for Agricultural Biomaterials, Seoul National University, Korea, which has organized symposia on agricultural biotechnology annually since 1990. Many important results on new types of carbohydrate-active enzymes and their applications have been reported at these meetings. Papers in Part one of this collection focus on structure-function relationships of carbohydrate-active enzymes. Papers in Part two discuss functions and applications of carbohydrate-active enzymes, such as enzymes for grain processing and glycosidases and their mutants as useful tools for glycoside synthesis. With its distinguished editor and international team of contributors, Carbohydrate-active enzymes: structure, function and applications is an essential reference for research scientists, post-graduate students and those in the food industry with an interest in enzymes. Professor Kwan-Hwa Park is Director of the Center for Agricultural Biomaterials and Professor in the Department of Food Science and Biotechnology at Seoul National University, Korea. He has published widely on the mechanisms of action of carbohydrate-active enzymes and their applications.